The Tax Cuts and Jobs Act of 2017 enacted last December provided the most sweeping changes to the US tax code in more than 30 years. It included more than 500 pages, with detailed changes affecting everything from marginal tax rates to the treatment of mortgage interest expense. For most taxpayers, the three biggest changes have to do with 1) a higher standard deduction, 2) new limits on many popular deductions, and 3) new income tax rates. 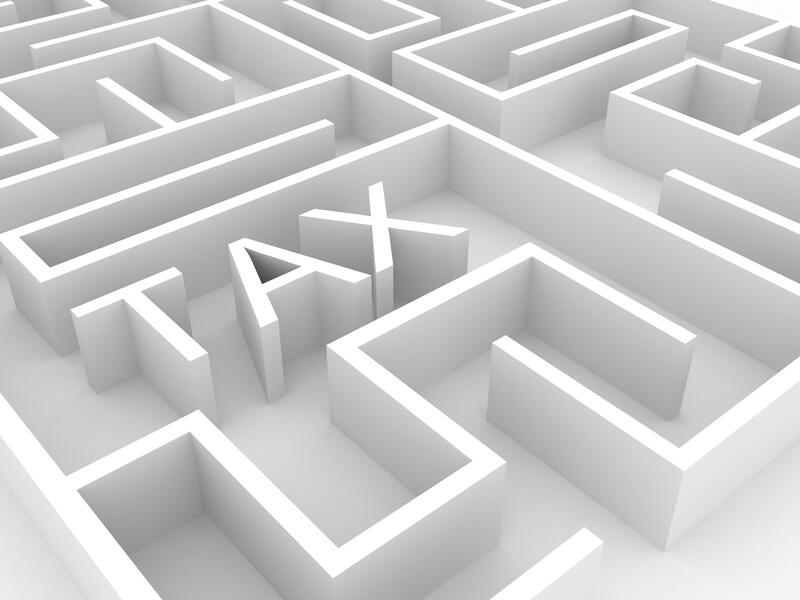 Here is a quick overview of the changes and details on how they may affect your taxes. Although the headline grabber was the change to marginal tax rates, another major change from tax reform is a sharp increase in the standard deduction. For tax years 2018 through 2025, the standard deduction will be $12,000 for single filers and $24,000 for married couples filing jointly. That is nearly double the levels in 2017. The law also slightly increases the higher standard deduction for the elderly, the blind, and persons with a disability. But it eliminates the $4,050 personal exemption (see table below). 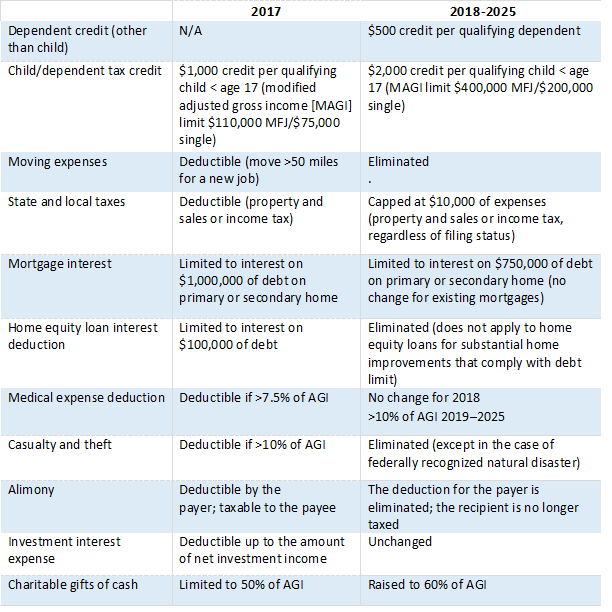 The miscellaneous itemized deductions in excess of 2% of AGI that were eliminated include: tax preparation fees, investment management fees, unreimbursed work-related expenses, and job search fees. As stated above, there were no changes to the tax treatment of capital gains and dividends. They remain at 0%, 15% or 20%, depending on your tax bracket. The Tax Cuts and Jobs Act also reset the tax brackets for 2018, setting new income thresholds and tax rates, while retaining the total number of seven brackets. Because of the changes to the tax brackets, checking your withholding amount can help ensure that you're not withholding too little tax, which may result in an unwanted tax bill or penalty next April. If you don't pay enough tax, either through withholding or estimated tax payments, you may be subject to a penalty for underpayment. According to the IRS, you could owe a penalty if your total payments (from withholding and estimated tax) do not equal at least 90% of your tax liability for the year or 100% of your prior year tax, whichever is smaller. Conversely, you generally don’t want to withhold so much that you provide an interest-free loan to the government and later receive a big refund. Most CPAs advise targeting a withholding amount that closely matches your tax liability, which allows you to put your money to better use by adding to your child’s 529 Plan or saving for retirement throughout the year. The IRS has recently updated its withholding calculator to incorporate the tax changes. It's a good idea to do a withholding check-up as soon as possible, and if necessary, to make some changes, fill out a new Form W-4 and submit it to your employer. Keep in mind that these tax cuts are not permanent, and tax withholding will continue to need revisiting. The Tax Cuts and Jobs Act gives a permanent tax cut to corporations, but the individual tax cuts are set to expire after the 2025 tax year unless legislation is passed to extend them. As always, Gap Financial Services will continue to follow an evidence-based investment process that is backed by decades of academic research and aligned with your tax objectives and financial goals. If you have any questions, please contact us any time. Disclaimer: This article is provided for general information and illustration purposes only. Nothing contained in the material constitutes tax advice, a recommendation for purchase or sale of any security, or investment advisory services. We encourage you to consult a fiduciary fee-only financial planner, accountant, and/or legal counsel for advice for your specific situation. Additional details on Individual Tax Reform can be found here. Gap Financial Services, LLC is a Registered Investment Advisor. The information on this site is provided “AS IS” and without warranties of any kind either express or implied. To the fullest extent permissible pursuant to applicable laws, Gap Financial Services, LLC (referred to as “Gap Financial”) disclaims all warranties, express or implied, including, but not limited to, implied warranties of merchantability, non-infringement and suitability for a particular purpose. Gap Financial does not warrant that the information will be free from error. None of the information provided on this website is intended as investment, tax, accounting or legal advice, as an offer or solicitation of an offer to buy or sell, or as an endorsement of any company, security, fund, or other securities or non-securities offering. The information should not be relied upon for purposes of transacting securities or other investments. Your use of the information is at your sole risk. Under no circumstances shall Gap Financial be liable for any direct, indirect, special or consequential damages that result from the use of, or the inability to use, the materials in this site, even if Gap Financial or a Gap Financial authorized representative has been advised of the possibility of such damages. In no event shall Gap Financial have any liability to you for damages, losses and causes of action for accessing this site. Information on this website should not be considered a solicitation to buy, an offer to sell, or a recommendation of any security in any jurisdiction where such offer, solicitation, or recommendation would be unlawful or unauthorized. We are considered a fee-only fiduciary planner in Austin and a fee-only fiduciary planner in Boerne.